Hmmm, interesting. If it's priced right it could be worth getting. Retro-Bit – the company behind a series of clone systems and repackaged classic games – has already confirmed that it is working with Sega to produce a series of officially-licenced accessories for the Sega Genesis / Mega Drive and Sega Saturn. The company is showing these products off at CES right now, and they look so close to the real thing it's actually impressive (whether or not they feel as good is something we'll be investigating when we get our hands on them). 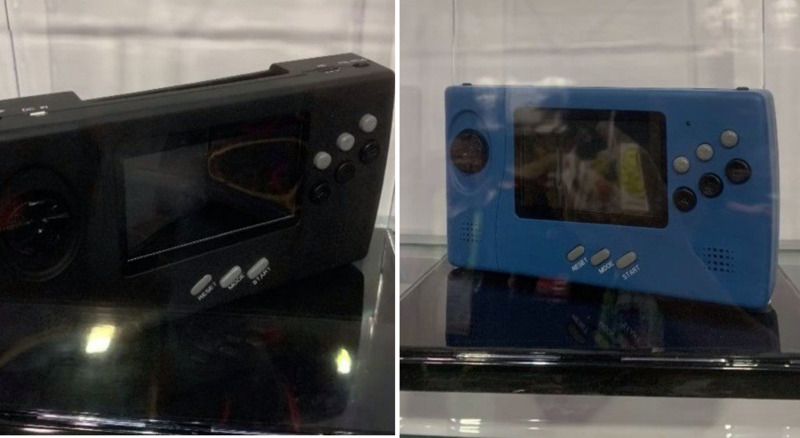 However, Retro-Bit has something else at CES which is even more interesting – it's showing off a prototype of what appears to be a reborn Sega Nomad. If you didn't know already, the Nomad was Sega's ill-fated attempt to turn the Mega Drive into a portable system – if was kind of like the Switch before the Switch existed. It ran all Mega Drive (well, Genesis) games and could be connected to the TV for the full home console experience. While it was impressive for the time, it ate batteries like nobody's business and didn't really find the audience it perhaps deserved. Fast forward to the present day, and modern rechargeable batteries and LCD screens should make this a more viable proposition, and the rumoured price point of around $80 would also make it pretty appealing. It's worth noting that a lot of speculative hardware gets shown off at CES, and seeing as both of the units shown lack Sega's branding, it could be that these units have yet to meet with the company's approval. We already have the Hyperkin Supa Boy, so it would be great to have a 'new' (and more importantly, decent) Mega Drive portable. Sega fans have had to endure some real stinkers in the past, with the decade-old GenMobile being the last notable system that actually allowed you to use original carts on the move. I just don't get the point of devices like this. Is there really an audience for them, besides collectors who will just buy it to sit on a shelf as a display item? You can already play pretty much any retro system on your phone or tablet. And if you're not into that because of the lack of physical controls then get a gaming tablet. I actually owned a Nomad, I bought one off Ebay around 2001-2002. I had the rechargeable battery pack and would take it to school to play on the bus. At that time there wasn't any portable emulation devices so people still thought it was pretty cool I had a portable device that would play Genesis carts. In 2019 though this seems totally pointless. Is somebody really going to buy this and take it around with them with a bag full of cartridges? I really can't see anybody using this as a portable system the way the Nomad was intended. $80 is a pretty high price for such a useless device. I didn't even pay that much for my Nomad! Around 2012 I bought a gaming tablet a QPD G7. It was somewhere around $100-$120 so $20-$40 more than this new Nomad. Not only could it play Sega Genesis games but it could play basically any system up to and including the Dreamcast. It was really cool to be able to play Dreamcast games at full speed on a portable. I had a 32GB micro sd card in it. So that was able to hold every NES,SNES,Genesis and N64 games plus several Dreamcast games and still have room to spare. All that on a card the size of your fingernail. Why would anybody want this Nomad device that looks fairly bulky and that you would have to carry a bag full of cartridges around unless you want to play the same game all the time? Is it just me being a grumpy old man or are these devices pointless nowadays? The only system I could get excited about if they made a portable or classic version of would be the Sega Saturn since the emulation for it still isn't very good. Even a portable Dreamcast would still be kind of cool, but no when they do this it is always old 8-bit and 16-bit consoles that have had perfect emulation on PCs for over 20 years. It will have HDMI as well.